Why hasn’t anyone written a book like this before? If the Child IRA is such great idea, why haven’t we heard more about it? Isn’t this only for rich people? I thought you need to have a job to contribute to an IRA. Aren’t there laws against child labor? 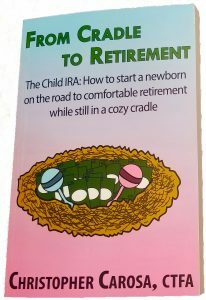 Where would someone go to establish a Child IRA? How does this book help parents? How does this book help grandparents? What kinds of jobs can kids get? How does this book help family owned businesses? What advantages do parents who own their own business have? How can children contribute to an IRA if the money they earn needs to be saved for college? How does this book help financial professionals? Does the book contain real-life examples of the Child IRA in action? What’s the one thing you learned in researching this book that surprised you?